If you’re feeling depleted and worn out you may be emotionally broke. 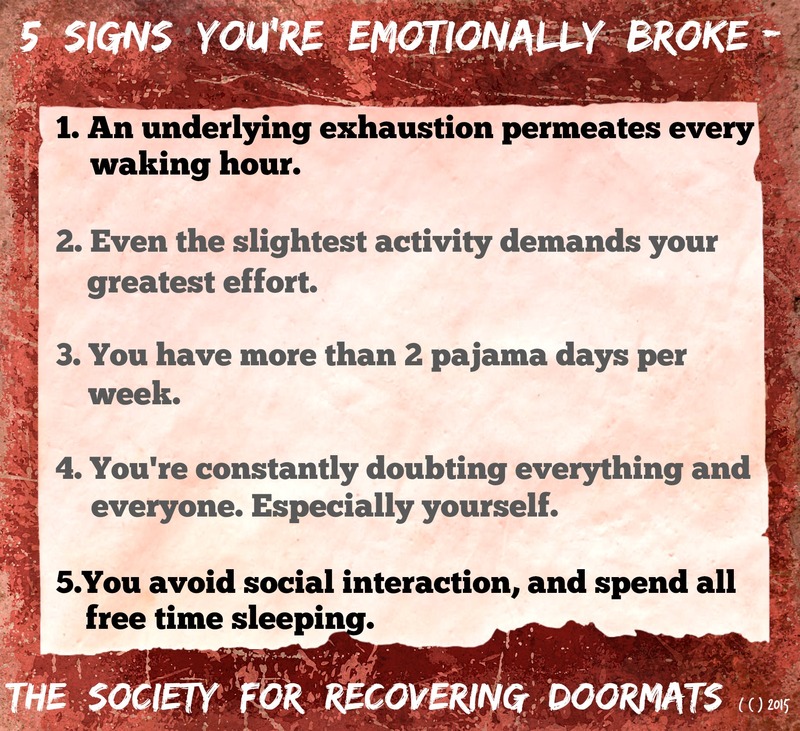 If any of these 5 signs are familiar, please deposit love and care into YOURSELF immediately! 1, 2 and 5 are especially true which is when you should see a doctor or therapist because you’re probably suffering from depression. What do you do when you feel this way and you are already on meds for depression??? Chronic Fatigue Syndrome, Fibromyalgia, Depression. Difficut to diagnose the difference. All seem to be overlapping. So true. I think only a very skilled professional can make the distinction between these. My pleasure. I’m just happy to help a fellow sufferer. Wonderful advice, Rose. And I agree with davesdining to discern if medical/therapeutic intervention is indicated. Thank you for your terrific posts! Thank you Dr. Segal. I always appreciate your comments. have been on ads for oso long. pj even when sitting with grandchild. Hi Cathy, try to make one day this week a NON PJ day. Even if it’s just showering and changing into an oversized tee shirt. Start really simple. Also, getting outside helps regain some emotional strength. Sending you hugs and love <3 Rose Gardner. Wow.. this is so me. All 5 and with my hair up in a ponytail and no makeup everyday. I used to do my hair and makeup everyday and dress nice and go do stuff . Now.. I only go out if i have to go to the store. I don’t interact with my friends anymore. You are not alone kickingk, many struggle during the holidays. Don’t be hard on yourself. Do something special for yourself at least once a day. It can be small, but take time just for YOU. <3 Rose G.
One very important weight to drop is feeling guilty for feeling this way. I think accepting the truth actually somehow starts a healing process which makes it less true. Seems to be a paradox. Thanks for speaking truth so we can embrace it. I can totally relate, I’ve had 3 straight pajama days this week. Alone, depressed feeling horrible and unwanted or needed. Like I don’t matter to anyone. People sure can make you feel low and unloved.